The Matrix Trilogy is an excellent opportunity to discuss what we expect from a science fiction film, especially one that is obviously dealing with Christian symbols. If we expect the film to simply be an allegory of Jesus Christ telling the gospel story in a different way, then we will not only be disappointed but also offended. But if we expect the film to explore the nature of spiritual struggle by presenting the most probable solution, then we will recognize its support of the central Christian message that the Savior must not only enter our world but must also take upon himself our struggle in order to conquer and offer us peace. This death on our behalf and the visual promise of a new heaven is a clear message of the Wachowski brothers. 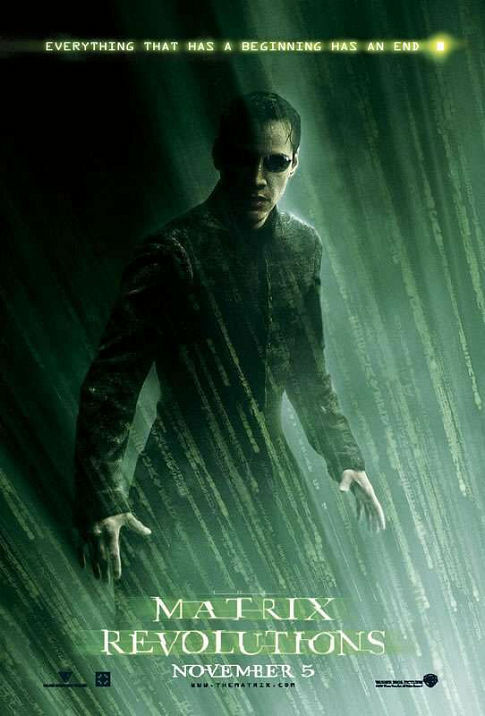 But this is not to say that “The Matrix Revolutions” is just a veiled story of “the Christian resurrection.” The differences are many and the heaven portrayed is obviously not a completely new heaven and earth. The questions and fears persist as the struggle between machines and humans remains. In this third film of the trilogy, we find the personification of evil presented not only in the machines, whose soulless need to remove the human resistance is mechanical, but also in a program which wants to dominate and destroy both machines and humans. Agent Smith (Hugo Weaving) began as a program created by the machines to fight within the matrix against the humans who have become free from the machines’ control. But in the second film, he interacted with Neo (Keanu Reeves) in such a way as to become his “shadow self.” This interaction not only changes Smith, but Neo as well. Now Smith can enter the “real world” outside the computer program called “the matrix,” but Neo can use his “matrix” power to fight the machines in the real world as well. In this change of events, the film plays with the Christian thought that there is evil that is not just an illusion but real and needs a real savior. To save the humans now, they need a savior who can defeat both the Matrix and the Machines. This victory comes on two fronts. It occurs when Neo and Trinity (Carrie-Anne Moss) go to the heart of the machine world and confront the machines directly. It also occurs when Neo goes to the heart of the matrix and takes within himself the satanic Mr. Smith and is symbolically crucified in the process. When Trinity brings Neo back to life in the first film, her love saves his life. This allusion to the Christian Triune God and the Father resurrecting the Son is obvious. However, in the second film, they become lovers and in the third film, she dies getting him to his destiny. If you were writing and directing this film, would you have changed their relationship? If so, how? The nature of evil is to destroy that which it possesses. When Neo returns to the matrix to fight Agent Smith, Smith has replaced all the people with himself and the weather with rain. How do you experience this self-worship and symbolic depression in your life and in the world? The suggestion that Neo had a “shadow self” comes from Jungian psychology. When Agent Smith became the personification of Neo’s evil, he was required to reabsorb it in order to destroy it. This “owning” of his own “shadow self” causes salvation for the Matrix. It does not, however, change the situation of the people under the machines’ control. How would you have created a salvation that was more holistic? The ability of programs to be sentient, or self-aware, is only a theory at this point in our quest for artificial intelligence. Do you believe it will ever be achieved and, if so, do you believe we will at some point need to enter into a war with it? Posted on July 24, 2011 by Cinema In Focus and filed under 3 STARS, THOUGHT-PROVOKING and tagged 3 STARS THOUGHT-PROVOKING 2003 ACTION SCI-FI CHRISTFIGURE R RATED.